Shah Abdul Latif Bhitai (شاه عبداللطيف ڀٽائي) was born in 1689 at a village called Hala Havelli near Hyderabad, Sindh. Shah Abdul Latif was the direct descendent of the Prophet Muhammad through Imam Zain-ul-Abideen, son of Imam Hussain. Shah's father, Syed Habib Shah had migrated from Hirat, Afghanistan to Sindh. When he was young, he fell in love with the daughter of the village’s landlord. The landlord however, turned against him and tried his best to harass his family. After that Shah Latif, left his home became a spiritual wanderer. In the quest of eternal love, he traveled in many parts of Sindh and adjoining lands where he met Sufis and Yogis. He spent three years in the company of these Sadhus. Finally, when he arrived in Thatta, he met a Sufi saint Makhdoom Muhammad Moin. He understood the inner condition of Shah Latif, and held him there for a few days. He then told him, "The truth, for which you are wandering around, is inside of yourself. A man is a mirror for a man. You've seen God's manifestation in the hand of that girl." After a few days living with that Sufi saint, Shah Latif felt inner satisfaction and then he left for Hala. By the time he returned to Hala, the landlord had already died he married the love of his life Bibi Saidha Begum who died within a few years of their marriage and he never married again. After her death, he would often seek solitude and spend most of his time in contemplation and Muraqaba (Sufi meditation) and writing poetry. He lived a very simple life. His food was simple as well as his dress, which was often of saffron color, the color of the dress of Sufis or Yogis, stitched with a black thread. For the last eight years of his life, he lived at Bhitshah, a small village built by him. A few days before his death, he retired to his underground room and spent all his time in prayers and fasting, eating very little. The great Sufi poet died in 1752 was buried at the same place where a shrine now stands. In 1866, 114 years after the poet's death, a German scholar Ernest Trump compiled Risalo, a complete collection of Shah Abdul Latif's poetry. Shah Jo Risalo (Sindhi: شاه جو رسالو) is the name of the compiled verses of Shah Abdul Latif Bhittai. Many scholars and linguists have published Shah Jo Risalo with their own compilations, hence its many editions are available. No single edition is believed to be the authentic, but the oldest manuscript of Shah Jo Risalo is believed to contain all the authentic verses of Bhitai. It is believed that Shah's verses were compiled in his life, but he did not like that and threw the only manuscript of his verses into a pond. Later, his devotees demanded him to write some verses, hence he told them many verses which were noted in writing. But most of his work was never written, only memorized by people, and became popular in the folk culture of Sindh. 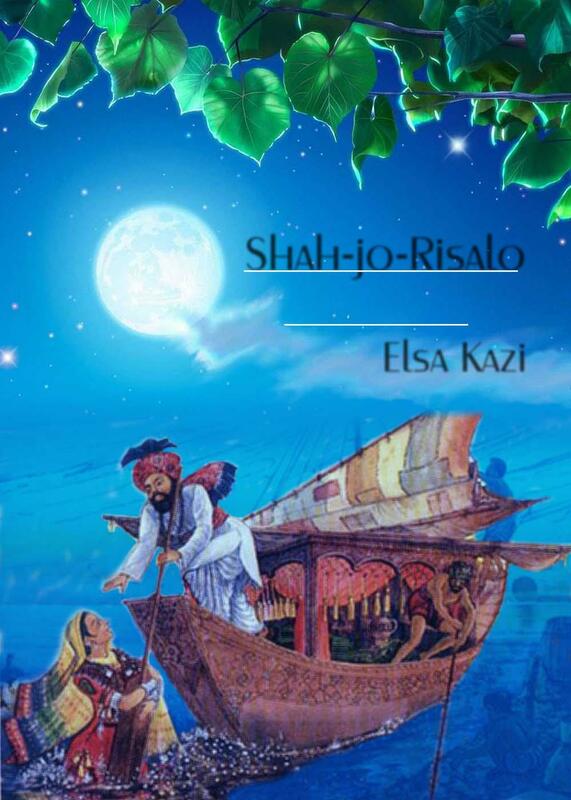 The traditional compilations of Shah Jo Risalo include 30 Surs (chapters) which were compiled by the renowned researchers. The oldest publications of Shah Jo Risalo contained some 36 Surs, but later most of the linguists discarded 6 Surs, as their language and content did not match with the Shah's style. Recently, Dr. Nabi Bakhsh Baloch, the most renowned linguist of Sindhi language has compiled and printed a new edition after 32 years of research in folk culture, language and history of Sindhi language. Here is selected translation in English by Madam Elsa Qazi, along with one chapter Kedaro (The Battle Ground) translation by Madam Amina Khamisani. The translation of Madam Elsa Kazi's was composed by sindhiana.com in 2002, from hard copy. I am thankful to them and here contributing for the awareness of the Poetry of Shah Abdul Latif Bhitai's message of Love, peace and harmony for the whole Human Kind. Recently I've added remained chapter The Battle Ground (Sur Kedaro which is translated by Madam Amina Khamisani) composed by me. There were some typing mistakes which have corrected from both translations. I've tried to compile here following materials so every one can find all related material from single page. 1: Folk story or Background of Chapter. 2: Related Raga's information along with musical notes. 3: Terminology of poetic words so every body can understand and even google translation can carry these words from that list. With the help of google translation in 51 languages, now it is easy to understand in all countries. I offer thanks to google too. My all aim and goal of this compilation is only one that we must show the world about the eternal peace message of Shah Latif, who was not only a sage or saint but really a milestone for the whole humanity. Shah Latif is flow of that super consciousness, which had given Vedas in yester centuries on the bank of mighty Indus river, and now he prays for all mankind, preaches for the peace love and harmony. Hate not but love, War not but peace. Today when whole world is in grip of rascal terrorism we Sindhis will proudly announce that we have the solution of peace. Listen us! We have message for all, we have our messenger in shape of Shah Latif. Elsa Kazi (3 October 1884 - 1967), commonly known as "Mother Elsa", was a German writer of one-act plays, short stories, novels and history, and one of the greatest poets of her time. She was also a composer and a musician of considerable achievement, involved in virtually every conspicuous branch of fine arts. Her paintings are often seen in many distinguished family homes. She also painted the famous courtesan queen of Khairpur Mirs, "Bali". Although not well conversant with the Sindhi language, she yet managed to come with some of the best translations of selected verses of Shah Abdul Latif into English with the support of her husband, Allama I. I. Kazi. She successfully couched the substance of those verses in a remarkable poetical setting which, in musical terms, reflects the original Sindhi metrical structure and expression in which Latif had cast them. Her translation of Shah Abdul Latif's poetry still remains the best so far in the English language. She born Gertrude Loesch in Rudel Stadt, a small village in Germany, in the house of a great musician who ultimately migrated to Dulwich London, Elsa's father was a prosperous German Elderman who had property in London that was destroyed in World War II. After the war, compensation was paid to her for the property destroyed. It was in London that she met Allama I. I. Kazi by sheer chance. It so happened that Allama Kazi, having arrived at the railway station while the train had already started moving, managed to board in the last compartment which was empty, except for a solitary young lady occupying a corner quarter. Reared in a traditional family background, Allama felt very much embarrassed and kept standing near the door with his back to the lady. Elsa was amazed, astonished and amused to meet a man who would not take seat, despite repeated offers and would only repeat apologies. For a man who was so innocent and fascinating, she sought his address and thus developed a life long association. The couple was married in Germany in 1910. A young Student standing between the tombs of Elsa Kazi and II Kazi in the new campus of Sindh University The couple lived in London from 1911 to 1919, and occasionally made short visits to Sindh. Altogether, the couple spent 30 years of life in England, during which they remained engaged in research, tracing the evolution of religion through the ages up to the advent of Islam. Both of them contributed numerous essays, articles and addresses in various vital branches of modern knowledge, besides preaching Islam under the aegis of Jamiatul Muslimeen. In the year 1919, the couple returned to Sindh, and Kazi Sahib first entered the Government Judiciary Service, but subsequently joined the Khairpur State Service on deputation. Because of some differences with His Highness Mir Ali Nawaz of Khairpur, he resigned after a two years' stay and the couple left for London. The couple continued to propagate Islam in London till April 1951, when Allama was offered the post of Vice Chancellorship at the University of Sindh. After eight years, Allama resigned from the post and the couple lived a retired life at Hyderabad, Sindh. In the year 1967, Elsa was suddenly and seriously taken ill with a renal problem, and breathed her last at the age of 83. She had no children of her own but all the university students and all the residents of Sindh call her Mother Elsa. Furthermore, the name of the girls' hostel in the Mehran University of Engineering and Technology In Jamshoro and several other buildings are named after her. She now lies buried along with her husband, Allama I. I. Kazi at the New Campus of Sindh University in Jamshoro, Hyderabad.